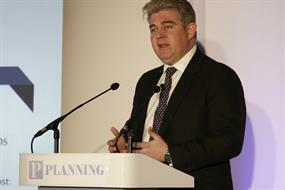 A skills crisis across the construction sector is the biggest current challenge for developers, rather than the operation of the planning system, planning minister Brandon Lewis said today. The author of the Labour party's review into boosting housing supply has defended a proposal to give the Planning Inspectorate powers to step in and take over the drawing up of local plans in councils fail to do so. Local authorities are 'still struggling with the notion that they are now responsible for strategic planning', a senior planning inspector has said at the second annual National Planning Summit. Planning is under threat in England, the speed of cuts to local authorities must be halted, and the next government must 'tackle the green belt', a panel of experts told the National Planning Summit. The government could remain under pressure to introduce further mandatory standards governing the design of new homes, the National Planning Summit heard today. Some councils are failing to involve their elected members in cross-boundary 'duty to cooperate' work on local plans at an early enough stage, a council planning chief has warned. The release of viability assessment information would on balance be a positive step that could help reduce the time taken to reach agreements, a partner at consultancy Deloitte Real Estate has told the National Planning Summit. Major housing development and shale-gas extraction schemes could soon be included on the list of acceptable Nationally Significant Infrastructure Projects (NSIPs), according to an infrastructure law expert. The question of green belt reviews 'will have to be addressed' by local authorities, the chairman of the Planning Officers Society has told the National Planning Summit. A London borough is to introduce a 50 per cent affordable housing requirement based on a 'dynamic viability model' derived from an annual analysis of the state of the property market, its head of spatial planning has said. Planners can have most effect on improving place quality by working on a strategic scale, design expert David Waterhouse told the National Planning Summit. A lack of opportunity for housing and retail-led Nationally Significant Infrastructure Projects (NSIPs) could be limiting developers' interest in pursuing the planning route for their schemes, an infrastructure expert has said.